Synchronizing your iPhone with your computer is a lot like syncing an iPod with your computer. But even if you’ve never used an iPod or iTunes, syncing your iPhone with your computer isn’t difficult. Connect your iPhone to your computer with the USB cable that came with your iPhone. When you connect your iPhone to your computer, iTunes should launch automatically. If iTunes doesn’t launch automatically, try launching it manually. If you’ve taken any photos with your iPhone since the last time you synced it, your photo management software launches and asks whether you want to import the photos from your phone. You can ignore this prompt if you want. 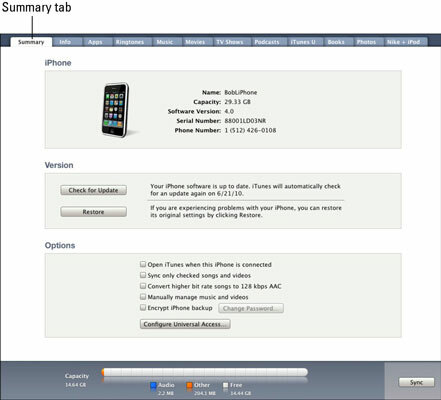 Select your iPhone in the iTunes source list. The Set Up Your iPhone pane appears. 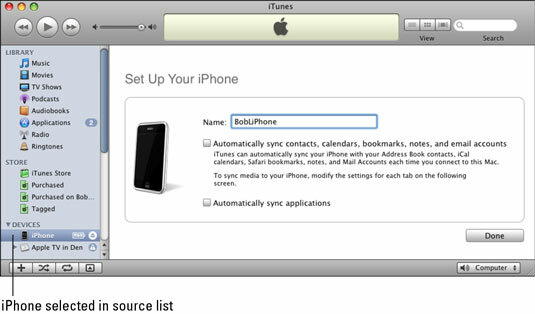 If you’ve already set up and named your iPhone, you can skip to Step 7. If you want iTunes to automatically synchronize your iPhone, select both check boxes. If you want to synchronize manually, make sure both check boxes are deselected. Click the Summary tab near the top of the window if you aren’t there already. If you don’t see a Summary tab, make sure your iPhone is still selected in the source list. Open iTunes When This iPhone Is Connected: Select this check box if you want iTunes to launch automatically and sync your iPhone whenever you connect it to your computer. You can later deselect the Open iTunes When This iPhone Is Connected check box if you change your mind and want to prevent your iPhone from syncing automatically. Sync Only Checked Songs and Videos: Select this option if you want to sync only items that have check marks to the left of their names in your iTunes library. Convert Higher Bit Rate Songs to 128kbps AAC: Selecting this option lets iTunes automatically create smaller audio files so you can fit more music on your iPhone. Manually Manage Music and Videos: If you select this check box, you can turn off automatic syncing in just the Music and Video panes. If you didn’t select the Open iTunes When This iPhone Is Connected check box, click the Sync button in the bottom-right corner of the window. 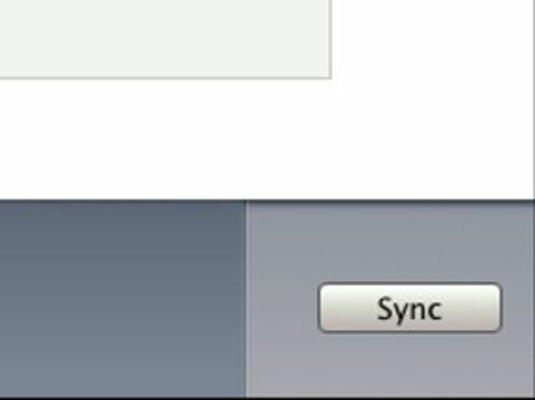 By the way, if you’ve changed any sync settings since the last time you synchronized, the Sync button will instead say Apply.